It may be a tad cold outside, but it doesn’t need to be spring to enjoy spring rolls. We hope our Pointe at Suwanee Station community members enjoy these fantastic spring roll tips. If you enjoy spring rolls in a restaurant, you are going to absolutely love these delights when they are freshly made at home. Even the fanciest restaurant would have difficulty challenging your ability to select only the freshest ingredients and preparing them within an hour of returning from the grocery store. Immediate freshness is tough to beat. That being said, excellent spring rolls require some time and patience. They are worlds away from throwing a ready-made pizza in the oven. Chefs are tasked with a fair amount of mindful slicing and dicing. While the prep work will most likely outweigh the time it takes to dine on your spring rolls, it will be well worth it. Another aspect that tends to steer home chefs away from making spring rolls is that they seem delicate. In reality, spring rolls tend to be quite forgiving. 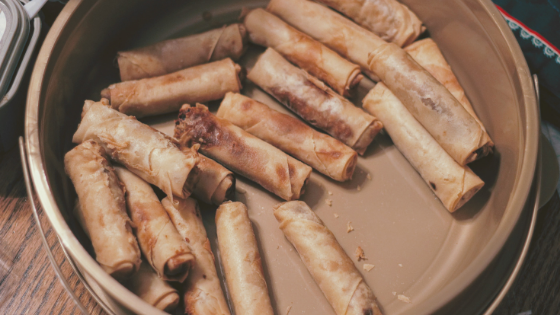 The following recipe will introduce you to the joy of making fresh spring rolls at home. To best make super-fresh spring rolls, take this ingredients list to the market and select the freshest possible ingredients. Boil the noodles, then drain and rinse with cold water. Place rice paper in one inch of water for 15 seconds. Gather all of your pre-chopped ingredients and layer 1 to 3 slices of each veggie and mango with 3 to 4 shrimp down one side of the rice paper. Pinch over the herbs and a modest number of noodles. The blend should not exceed one-third of the paper. Fold the sides over the mix and roll together like a burrito. Serve with peanut sauce. If you or a friend would like more information about our Suwanee apartments, call us today.